After months of preparation and anticipation, the day finally arrived. On 26 July, the last two core scanners were delivered and moved into place within the new Core Scanning Facility at BGS, Keyworth. Many hands make light work was especially true for the BGS estates & facilities management and CBRE teams, who made it possible that both oversized instruments were successfully lifted into the building. The large window in front of the old ‘long stay cafe’ was removed and scaffolding erected. Interior work was carried out by a great bunch of hardworking staff, knocking down walls, and removing door-frames and shelves. On the day, TEP Machinery Movement Ltd were in charge of the lift. Heavy instrument parts weighing up to 750kg were lifted up and carefully navigated through the narrow corridor with only millimetres to spare. The first instrument to be lifted was the Itrax MC Scanner, which was delivered a day earlier from Cox Analytical Systems in Sweden. Jonny Rudolfsson, part of the Cox crew, was present during the lift to answer any questions about the scanner and to make sure that everyone took the necessary care in handling such a delicate instrument. The arrival of the Geotek MSCL-XYZ was equally exciting as the big lorry entered the BGS site. The whole Geotek Team helped with the process of unloading, lifting, and moving the valuable instrument. Both XRF scanners (Geotek MSCL-XYZ and Itrax MC) will be used to acquire elemental abundances and variations downcore and to produce 2D XRF surface maps of specific target areas of the core. 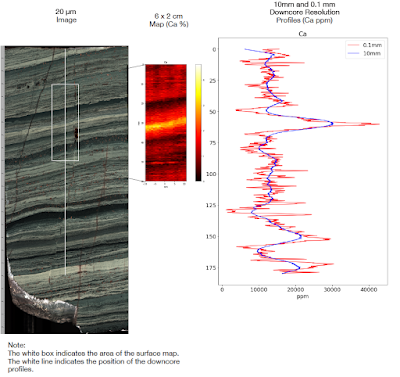 Additional colour linescan and UV imaging capabilities provide records of downcore textural/compositional variation. The scanners are able to detect a wide range of elements (Mg to U at ppm levels) and allow high-resolution scans, down to 0.1 mm, to be realised. The state-of-the-art high-throughput capability of both scanners allows several metres of core (up to 9 m) to be analysed at once. XRF scanning is now a well-established, non-destructive technique in various geoscientific and engineering disciplines, where datasets are used to identify critical horizons (e.g., trace metals, ore deposits, cements, soils), to better understand sediment/rock provenances and to implement core-to-core and/or core-to-log correlations. Further, calculated element ratios are often used as proxies for mineralogical, matrix, or environmental changes. Example: High-resolution image of BGS tuff sample alongside elemental surface map and downcore resolution profile for the element Calcium (Ca). 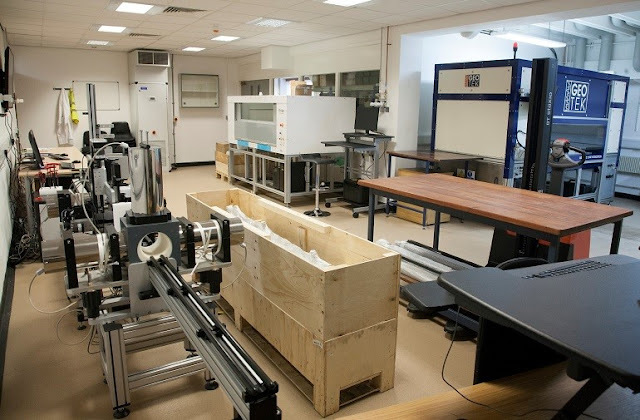 The new core scanning facilities have been funded by the UK Geoenergy Observatories project and more information about the project is available here. The project, commissioned by the BGS's parent body the Natural Environment Research Council (NERC), follows the Government's 2014 announcement that it would allocate £31 million to create world-class, subsurface energy-research test centres.